Become a software developer in 12 weeks. Guaranteed. The boot camp was everything I could hope for and more. We were a small group of 10 students and the lessons were taught in a cool office in the center of Ho Chi Minh City by one main instructor and two teaching assistants. The days were divided into lectures and working on labs by ourselves to practice what we just learned. Every single day was challenging and ended with me going home absolutely exhausted. It was coding all day every day including weekends. I loved it. Monday to Friday, 10:00 to 18:00. It's for people truly dedicated to making a big change. All classes are held at CoderSchool - 12 Ton Dan, District 4, Ho Chi Minh City, Vietnam. Students learn how to build dynamic web applications using Python 3. Students will master Flask, a popular lightweight web framework. Students learn to build productive, scalable front-ends with React, creating slick, functional, reactive code with Redux as a state manager and Flask as the back-end JSON API. Students work with instructors to come up with solo project concepts and spend two full weeks building truly sophisticated applications on their own. If you don't get a job, you get your money back. CoderSchool was born out of a genuine desire to not only educate, but also connect ambitious, talented individuals together to accomplish great things. We'll continue to support you long after you graduate. 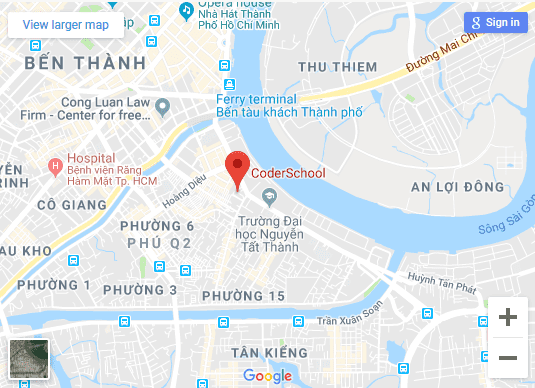 We've taught in Vietnam since 2015 and have over 500 CoderSchool graduates. Our educators come from Google, LinkedIn, Pinterest, UC Berkeley, Yale, and others. What is the CoderSchool bootcamp? Am I ready to work if I join this course? Is there any requirement? Do I need to know coding beforehand? Fully refundable if you don't get a job after the course. $500 $350/mo for 13 months after your first job placement. How'd you hear about CoderSchool? Designed and Developed by iAN TRAN - CoderSchool bootcamp graduate.